Regional politicians seem more concerned than ever with looking green — all while sucking more green out of taxpayers' pockets. Whether it is the $783 million sewage treatment plant in Greater Victoria, the $450 million waste incinerator in Metro Vancouver or the $3 billion subway line to Vancouver's University of British Columbia campus, these projects are nowhere near as environmentally green as politicians claim them to be. Regional politicians seem more concerned than ever with looking green — all while sucking more green out of taxpayers' pockets. Whether it is the $783 million sewage treatment plant in Greater Victoria, the $450 million waste incinerator in Metro Vancouver or the $3 billion subway line to Vancouver's University of British Columbia campus, these projects are nowhere near as environmentally green as politicians claim them to be. 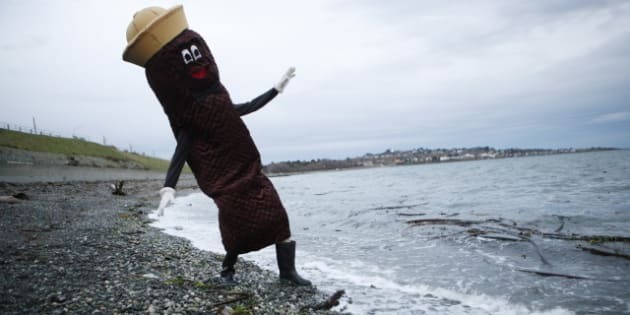 In Victoria, politicians were shamed into approving a $783 million sewage treatment plant — paid for in equal parts by federal, provincial and capital region taxpayers — by Mr. Floatie, a guy dressed up like poop. That translates into $240 to $391 extra in annual tax bills for Greater Victoria residents — just for this one plant. But the ultra expensive plant may not even be necessary. In fact, scientists say the money is being spent due to perception, not need: "Despite scientiﬁc evidence that there are no major environmental or human health impacts, this discharge of 'untreated' sewage has been a constant irritation to the city's U.S. neighbours and to environmental groups." Dr. Tom Pedersen of the Pacific Institute for Climate Solutions has made a compelling case against the plant, noting the current discharge of sewage into the ocean is a "tiny pinprick of nutrient-laden, organic sewage... and Mother Nature's really good at processing that." Still, regional politicians are pushing ahead, flushing tax money down the toilet. Meanwhile in Metro Vancouver, politicians are forging ahead with plans to build a $450-million waste incinerator that will reinforce our addiction to garbage, freeze out private contractors and put the Fraser Valley air shed at risk. The cost could increase the average property taxpayer's garbage bill by 43 per cent. The Fraser Valley is well educated on the fragility of its air shed, thanks to its battle against Sumas Energy 2, a U.S. power plant that would have annually created 2.5 tonnes of air pollution. Valley leaders have been unrelenting in their opposition to Metro burning waste for the same reasons. Still, Metro is pressing on, noting they are "a leader in green," as chairman Greg Moore says. But the dream of being a "zero waste" community is at odds with needing a steady stream of 300,000 tonnes of garbage at the incinerator. Then there is the City of Vancouver's preposterous push for a 12-kilometre, underground SkyTrain line to UBC. It is by far the most expensive transit option they could have dreamed up — coming in at $3 billion, for which they expect federal, provincial and TransLink taxpayers to pick up the tab. It's all part of Vancouver's plan to become "the world's greenest city." Taxpayers already shelling out for TransLink property taxes, gas taxes, parking taxes, tolls, fares and hydro taxes, should be the ones turning green — with nausea. SkyTrain is already an expensive transit technology, and putting it underground makes it even pricier. UBC sustainability professor Patrick Condon has even noted that putting $3 billion into an investment fund would generate enough annual income to purchase a Toyota Prius hybrid for every new undergrad student at UBC. Another Condon report notes that the UBC SkyTrain cost would fund 175 kilometres of light rail lines across the region, on both new and existing right-of-ways. Regional politicians get overly excited with the possibilities of going green — even when the perception doesn't line up with reality. But it's taxpayers who bear the brunt of these billions of dollars in costs. For taxpayers, it's not so easy being green.